You can be one step closer to a pirates life with the elegant and stylish Black Pearl Pendant. Famous for being an uncatchable vessel, this piece of jewelry is as adventurous as it is fashionable, so purchase your pearl today. 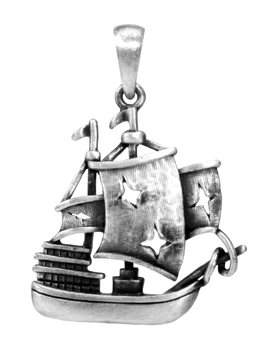 This sailing piece was constructed from lead free pewter and captures the essence of a pirate ship. With careful molding and engraved detail this is an authentic replica that will be recognized by any pirate fans. 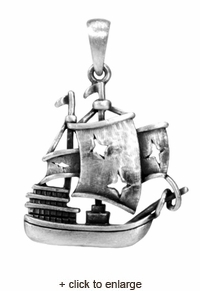 With torn sails, this unique piece will can be a great nautical accessory. Ideal for any fan of the ocean, the Black Pearl Pendant can enhance the look and feel of any outfit within your wardrobe.